A Cannula is a flexible tube that is inserted into a bodily vessel, duct or cavity, generally to administer a substance such as medication, or drain fluid. It often has a a sharp , pointed instrument, called trocar, at one end for puncturing the body so that it may get into the intended space. Although many different types of Cannula are available, the most commonly used in hospitals and other healthcare facilities is Intravenous Cannula. 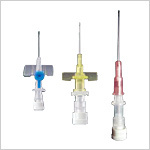 GPC Medical Limited, highly reputed manufacturers & exporters of hospital equipment & devices, produce a wide range of disposable medical items including IV Cannula. Premium quality material is used to produce our Cannula in various sizes. Very strict hygienic standards are maintained for testing and packaging the finished product. Our cannula are as per the international quality standards. They are reliable and safe. With an easy grip, they are user friendly. The GPC IV Cannula, in very big quantities, are regularly exported to many different countries across the world. Send Your Buy Requirement For "IV Cannulas" AND Get Quote Quickly.